I met Vysiion marketing manager Rob Pendleton through a conversation on Twitter. After eventually meeting face-to-face, Rob asked me to quote on the design of some marketing collateral Vysiion had a need for. The immediate requirement was designs for three pull-up exhibition stands, as well as a larger pop-up stand. Vysiion had no current marketing collateral, or at least, it was very old. A recent re-design to their website used some illustrated icons, covering their detailed managed, professional and communications services. It made sense to link these through to the printed marketing collateral and add to the design style. Starting with the pop-up exhibition stand, I took their existing brand colour palette and created a simple infographic which detailed three key areas of their business – Professional Services, Communications & Infrastructure and Managed Services. 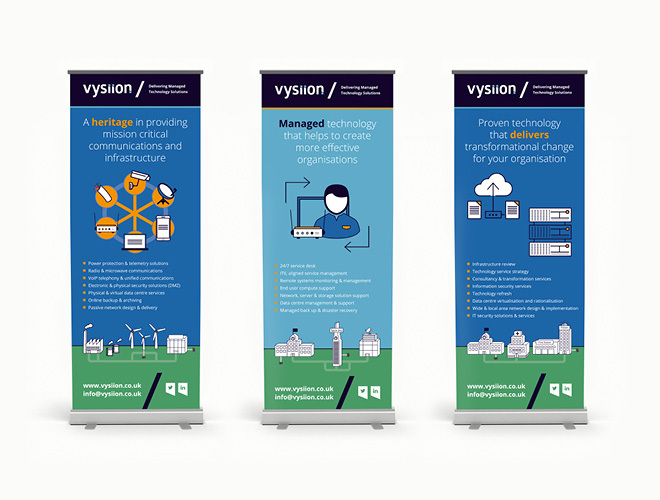 With the exhibition stands done, Vysiion were keen to also have a printed leave-behind to hand out, which would cover their core services. This was in the form of a simple four-page A4 brochure, which also appears as a single-page pdf online. Vysiion have now used the exhibition stands at recent events and are keen to produce a folder in the near future, as a hand out, which will contain the four-page brochure, along with a branded notepad. We’re also in the process of updating banners on their core social media platforms, to bring them in line with the rest of the design style of the marketing collateral.